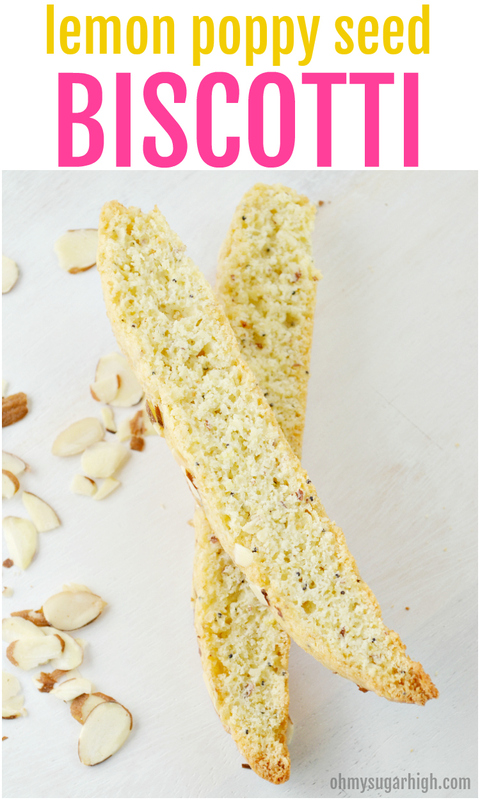 Do you love homemade biscotti? 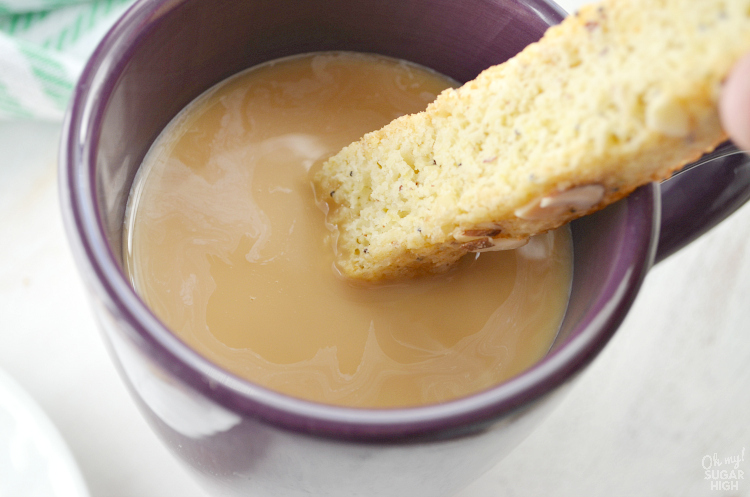 I recently made this lemon poppy seed biscotti and added a slice (or two) with my coffee. Amazing! I’ve always enjoyed biscotti, but I like it better when it is crunchy but not rock hard. Homemade biscotti is so much better than store bought and very easy to make. If you haven’t tried it before or you are just looking for a new recipe, I highly recommend this one! Every morning after I send my boys off to school, it is my time to sit down at my computer and get work done. I can’t do this however, without my cup of coffee. It is one of my favorite parts of the day. The house is generally quiet as my three year old is typically still sleeping. I usually feel somewhat refreshed by this time, even if I’m low on sleep because I’ve woken up as I got my kids ready for school. If I have something that I enjoy with my coffee, even better. 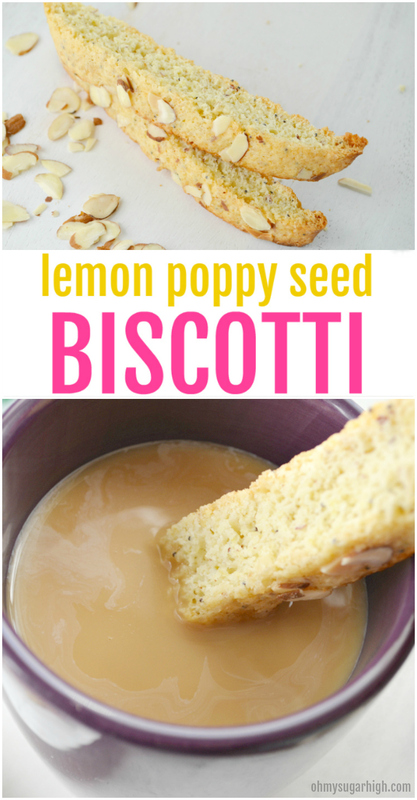 Feel free to add more poppy seeds to this lemon biscotti if that is your preference. I used a smaller amount to avoid poppy seeds in my teeth. Also keep in mind that your dough will spread out a lot as it bakes so don’t try to put both loaves on a single baking sheet. If you like a crunchier lemon poppy seed biscotti, you can go longer than 10 minutes on the second baking. Just be sure to keep a close eye on them so you don’t end up with burnt biscotti. Enjoy homemade biscotti? 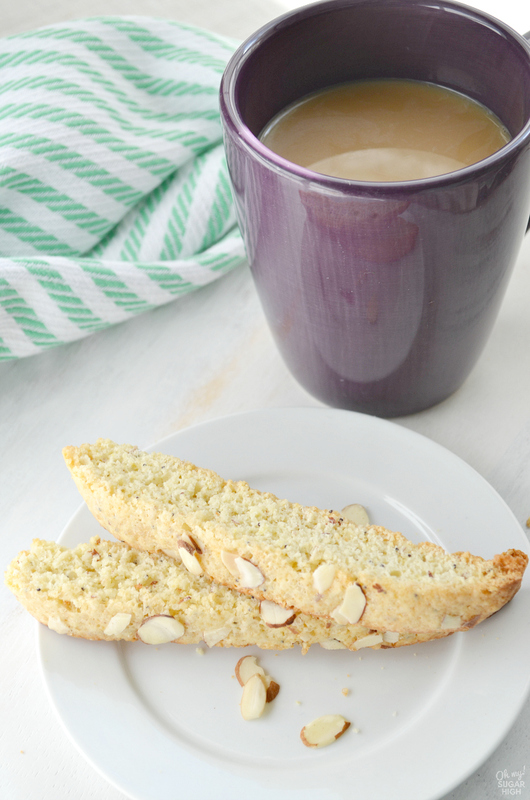 Make this lemon poppy seed biscotti for the perfect pairing with your coffee or tea. 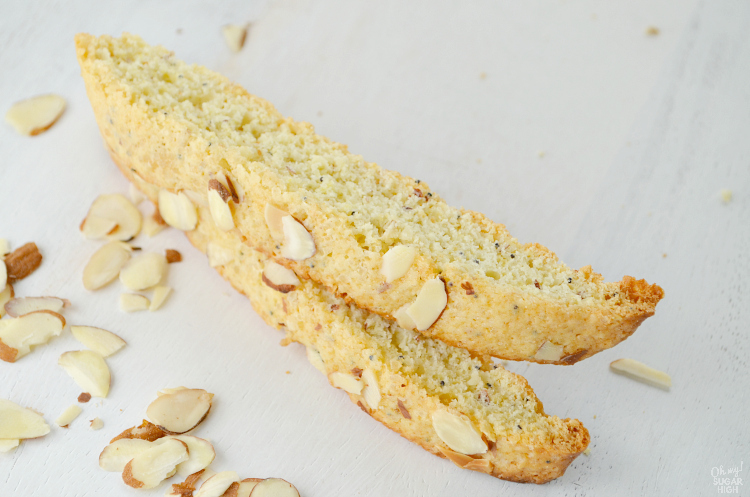 You'll love dunking this crunchy lemon biscotti with almonds! Combine the flour, ground almonds, baking powder and baking soda. Set aside. Beat the sugar and butter until well combined. Add lemon peel, poppy seeds, egg, egg whites, and lemon extract. Add the dry mixture and mix well. Divide dough in two mounds in center of baking sheets. Brush leftover egg yolk or milk over dough. Sprinkle each log with 1/4 cup sliced almonds. Bake at 350 degrees F (175 degrees C) for 30 minutes. Cool 5 minutes, then move to cutting board. Using a serrated knife, gently slice 1/2 inch slices. Bake slices another 8 to 10 minutes until dry, turning halfway through cooking. 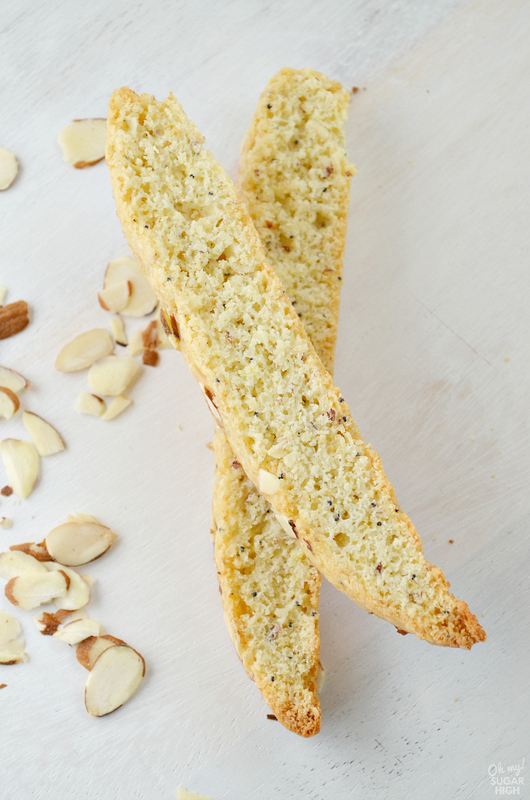 Do you have a favorite biscotti recipe? Biscotti is so good, but I’ve never tried it before. I bet it does taste better homemade. And lemon is so good on desserts. Thanks for sharing your recipe at Inspire Me Mondays! This looks beyond amazing! Thanks for linking up with What’s Cookin’ Wednesday!